Cruising down the freeway, you’re focused on the road and drivers around you. You fail to notice a seemingly insignificant small rock heading towards you, until it hits your windshield at full force. Most of the time, road debris bounces off the front of your vehicle and causes no damage, but you’re just one rock chip away from putting a dent in safe driving and a hole in your wallet. You better repair the windshield before that crack has time to spread. At your neighborhood Jiffy Lube, we offer windshield repair services, and when performed promptly, we can help windshield chips from cracking and prevent the need for windshield replacement. A vehicle’s windshield should provide you with a clear line of vision that’s paramount to safe driving; the Auto Glass Safety Council cautions drivers that windshield rock chips and cracks can interfere with their line of sight, and windshield damage may even impede drivers from seeing and responding to roadway hazards. . Caring for your windshield, including periodically replacing your windshield wipers is simple preventive vehicle maintenance all drivers can put into practice. Extreme temperature contrasts: when summer’s heat combines with a vehicle’s air conditioner or winter’s cold with the defroster, it can stress the windshield resulting in more damage. Cold temperatures: cold weather can cause windshields to bend into a more concave shape and increase horizontal cracking. Heat from the sun: the sun’s heat distorts the windshield’s shape producing vertical cracks. Bumps in the road: going over speed bumps, potholes, and uneven surfaces can result in more cracking. When a windshield chip repair is delayed, dirt can seep inside the damaged area and make the repair more difficult. For the best results, respond quickly to all windshield chips. First, cover the area with clear tape to keep out debris, and, as soon as possible, obtain windshield services including windshield repair from your local Jiffy Lube service center. Our knowledgeable technicians will initially remove any visible debris from the damaged area; this prevents a cloudy spot from forming inside the point of repair. A polymer will then be injected inside the chip to seal it. With this cost effective fix, your windshield will be repaired and your line of sight restored In approximately 30 minutes. 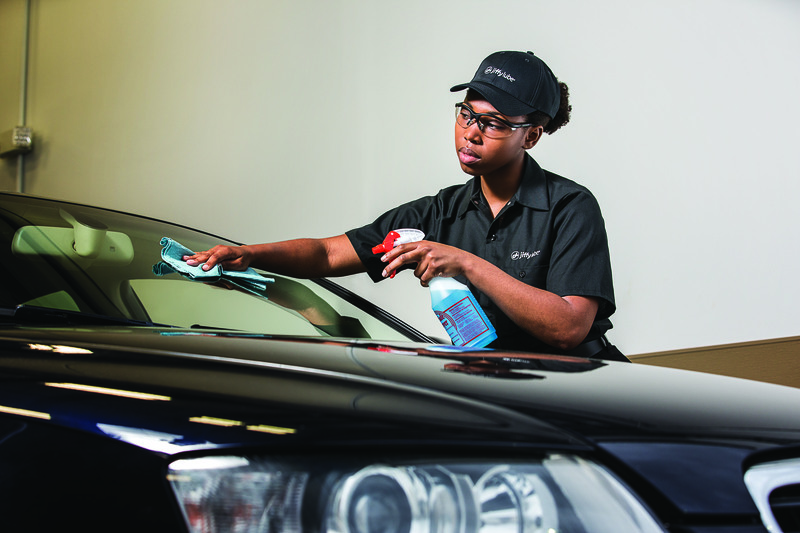 Check out our recent blog on windshield wiper care for related information. *Please call ahead to your local Jiffy Lube as not locations provide windshield repair service.